( FR ) Fire retardant knit polyester is our most popular fabric due to its durability, easy maintenance, flame retardant yarn, and excellent printability. Additionally, FR knit polyester is good for the environment because it comes from post industrial and consumer recycled plastic, and it's designed for long-term wear. Once retired from the trade show circuit, it can be reused, one example being costumes for school plays. The "FR" in FR knit polyester stands for Flame Retardant. Our material is not cheap imported fabric that is dipped or coated with chemicals to add flame retardant quality. Instead, our fabric table covers are produced in the U.S., use a flame retardant yarn for improved quality material and are certified. For custom table throws, flame retardant knit polyester is better than woven or poplin fabric because it doesn't require ironing or pressing after washing. 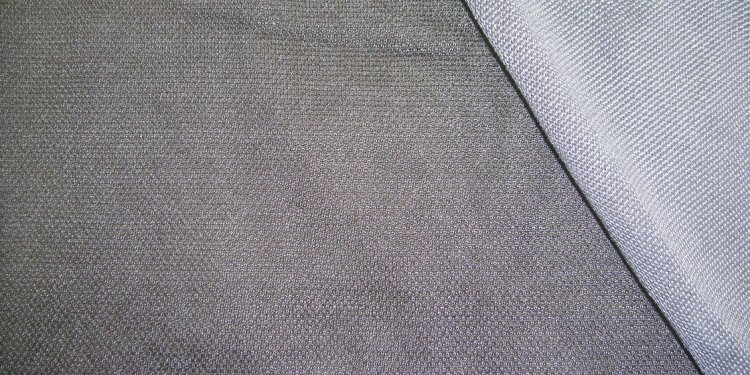 Woven fabric table covers are similar in structure to a men's dress shirt, which may require pressing to remove wrinkles. FR Knit polyester is also a great canvas for printing 1, 2 or full color designs and logos. The texture holds intense and vibrant colors beautifully. Knit polyester without the flame retardant yarn has many great qualities. Knit polyester fabric is lightweight, so it travels easy and is great for people on the move. Additionally it is wrinkle resistant, washable, and breathable while still maintaining it's durable nature. For the value conscious, knit polyester is the perfect fabric if you know you will not need the certified fire retardant yarn found with our FR knit polyester. But we caution, there are different flame retardant rules and regulations that require draperies used in public spaces to meet NFPA 701 standards. So it is important to understand where these table covers will be used, and then take steps to make sure your meet venue requirements while also reducing any risk of potential fire. For these reasons, most people simply choose our FR knit polyester to avoid any unforeseen challenges.